Show your guests you're paying extra attention to them with this miniature moisturizing set of guest sized heart-shaped soaps; the soft neutral color works beautifully in combination with any décor. This Heart Guest Soap Set of 4 is the easiest addition to the host or hostess routine with the best results. Custom made and stamped with the Jan de Luz insignia, they’ll moisturize your hands and leave a subtle sweet jasmine scent every time you use them. 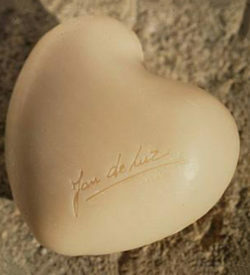 Smooth and soft to the touch, these tiny heart shaped soaps were designed and made in France. In fact, in the creation of this custom heart shaped soap, Jan de Luz specifically used the jasmine scent for its historical symbolism of femininity, grace, and delicacy (as well as the great smell that comes with it)– all of which are highlighted and shown in our tiny soaps. There are a million uses for this small heart shaped soaps set! You can use them as a pretty detail in your (guest) bathroom, fill event party bags with them, or gift the shaped soap as thank-you gifts to friends or coworkers. Or they would make great party favors for wedding guests, or as bridal shower gifts for the bridesmaids; and with such soft coloring they will work with any theme. These soaps are hard-milled to give them an extra-long working life, which makes them ideal for homes that entertain frequently. And if these tiny beauties simply aren’t enough, try our larger Heart of Soap for an even bigger blast of soapy happiness. Or try our Relaxing Bath Tablet for a spoiled night in.